This Ruggard Memory Card Case can hold three CF, six SD, and six microSD memory cards while keeping them safe from shock and moisture. It features a molded-rubber interior lining, as well as a durable, impact-resistant exterior with a weather-resistant seal to keep out water, dust, and debris. 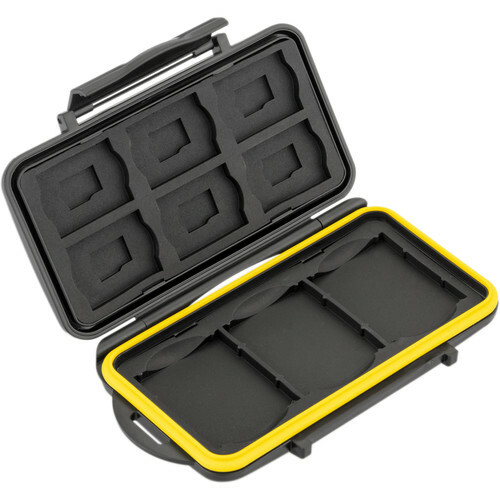 A sturdy snap closure helps ensure that this case's contents are secured while a built-in eyelet can accommodate a separately available lanyard to keep your memory cards within immediate reach. Box Dimensions (LxWxH) 9.4 x 5.3 x 1.75"